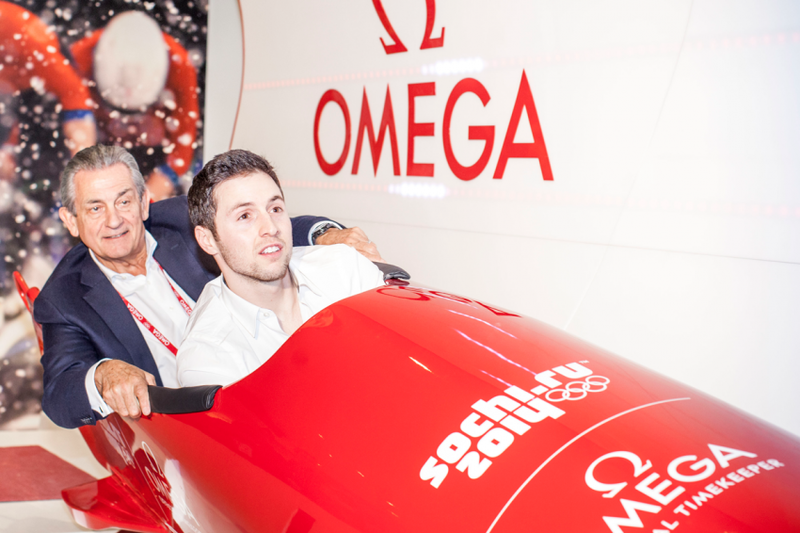 Two-time Olympic champion (moguls) Alexandre Bilodeau took a ride with OMEGA President Stephen Urquhart in the bobsleigh simulator at the OMEGA Pavilion in Sochi’s Olympic Park. We were all holding our breath here in Canada, while watching Alexandre preparing to go down on the bumpy trail at the mogul skiing competition in Sochi. We knew he’s good; four years ago, he was the first Canadian to win gold in Vancouver, but will he be able to do better than the others? Yes, he did it, he won gold again! OMEGA had the privilege to welcome Alexandre and his family at the OMEGA Pavilion in Sochi where he took a ride with Stephen Urquhart in the bobsleigh simulator, thin signed the “wall-of-fame”. Alexander wearing an OMEGA Seamaster Planet Ocean, a watch he received from the OMEGA Ambassador Michael Phelps following his gold in Vancouver.